If one asks the question: What is a PBX System? One will typically get the answer: A Private Branch Exchange. What is more important of course is understanding what it does. The PBX emerged from a desire of businesses to reduce the cost of telephone services, coupled with a need for more control over how phone services worked in their business. Prior to the PBX, every phone in an office required a separate circuit from the phone company (in exactly the same way as home telephone service is delivered)— one pair of wires from the Central Office to each and every desk that needed a phone. Since many (or perhaps most) of these phones would be unused most of the time, and since many (or perhaps most) calls happened between phones in the office, it became obvious that an office of, say, 100 people might only need a dozen or so lines to the outside world. The PBX answered this need by connecting trunks from the Central Office into the premises, and then provided extensions to each desk. 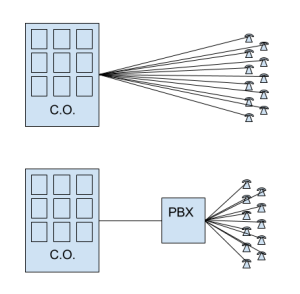 When a call was placed, the PBX would determine whether it was a desk-to-desk call, or an external call, and route accordingly. The question of “What is a PBX System?” (now a hosted PBX system) sometimes also includes mention of the KTS, or Key Telephone System. These were generally used in smaller companies (a handful of lines and maybe a dozen phones). In a Key System, the incoming lines appeared on buttons on each phone (sometimes called lamps because each button had a light under it). Each phone could see each line. This obviously would not scale well as a phone can only have so many buttons on it. As electronics improved, Key Systems often provided some of the line pooling features of their bigger PBX siblings, and most of the larger, better quality PBXs are also able to emulate a small Key System (which might be useful for example in an executive assistant or departmental reception) by providing a Shared Line Appearance (SLA) feature. So, what is a PBX system? Well, these days, it’s something far more than just a phone system from the past, and with new, standards-based and open-source platforms underpinning many PBX products, we’re only beginning to scratch the surface of what is possible. If you want to learn more, call 1-877-267-3835 for a free consultation (I’ll be happy to get on the call if you’d like), or check out our Hosted PBX Business Telephone Systems page.